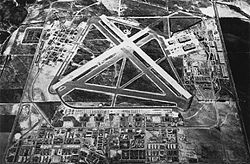 Marine Corps Air Station El Toro (ICAO: KNZJ, FAA LID: NZJ) was a United States Marine Corps Air Station located near Irvine, California. MCAS El Toro in 1993. MCAS El Toro in 1947. Before it was decommissioned in 1999, it was the 4,682-acre (19 km2) home of Marine Corps aviation on the West Coast. Designated as a Master Jet Station, its four runways (two of 8,000 feet (2,400 m) and two of 10,000 feet (3,000 m)) could handle the largest aircraft in the U.S. military inventory. While it was active, all U.S. Presidents in the post-World War II era landed in Air Force One at this airfield. The El Toro "Flying Bull" patch was designed by Walt Disney Studios in 1944. It survived virtually unchanged until the close of the Air Station. Following its decommissioning the site was used as a filming location, including the test track for the United States version of the BBC's Top Gear franchise. About 1,300 acres (530 ha) of land originally taken by the air station was converted into a large recreational center, the Orange County Great Park, while the rest was re-zoned for residential and commercial development. In May 1942, Lieutenant Colonel William Fox was directed to select the sites for all of the Marine Corps' West Coast air stations. Fox sought the most expeditious and low cost option and thus chose the already existing airports of El Centro, Mojave and Santa Barbara. For the fourth station, he chose land that had previously been looked at by the Navy for a blimp base. The Marine Corps gave the owner of the land, a farmer named James Irvine Sr., $100,000 for 4,000 acres (20 km2) including 1,600 acres (6.5 km2) designated for a blimp base. Construction of MCAS El Toro began on August 3, 1942 on land previously owned by the Irvine Company. The company greatly resisted the station's construction at this site, which at the time contained the largest lima bean field in North America, which was the company's prime source of revenue. The name El Toro came from the nearby small community which in 1940 only had a population of 130 people. The base headquarters was established on November 4, 1942 and the first landing occurred in late November when a Major Micheal Carmichael, flying from Camp Kearny, was forced to make an emergency landing among the construction equipment. The runways and taxiways were completed by 1 December 1942 and all squadron hangars were complete by 15 January 1943. Barracks and officer's quarters were ready by 20 January. January 1943 also saw the first operational units arriving at MCAS El Toro. First aboard were Marine Base Defense Aircraft Group 41 and VMF-113. They were followed later in the month by VMSB-142, VMF-224, VMSB-231 and VMSB-232, who were returning from fighting during the Battle of Guadalcanal in order to re-organize, re-equip and train. The station was formally commissioned on 17 March 1943, with Colonel Theodore B. Millard as the first commanding officer. Soon after its opening, MCAS El Toro was handling the largest tactical aerodrome traffic on the Pacific Coast. Already the largest Marine air station on the West Coast, in 1944, funds were approved to double its size and operations. By the end of 1944, the base was home to 1,248 officers and 6,831 enlisted personnel. In 1950, El Toro was selected as a permanent Master Jet Station for the Fleet Marine Forces, Pacific. To support this new role, the aviation infrastructure at El Toro was expanded significantly. For most of the ensuing years, El Toro served as the primary base for Marine Corps west coast fighter squadrons. During the 1960s, many US Marines left for and returned from Vietnam at El Toro MCAS. In 1958, Marine Corps Air Station Miami was closed which brought the 3rd Marine Aircraft Wing to El Toro. During the presidency of Richard M. Nixon, MCAS El Toro was used for flights to and from his "Western White House" at San Clemente, California. The land originally surrounding the base was mostly used for agricultural purposes when it first opened, but it the late 1980s and early 1990s, residential development began in the area; most of it was directly in the path of the base's runways, which proved to be a major problem as the constant loud noise produced by jets and helicopters passing overhead was very irritating to those living in the area. Few desired to move there because of this, causing the new neighborhoods to struggle. 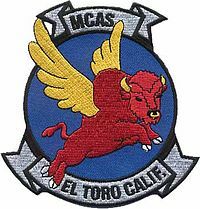 In 1993, MCAS El Toro was designated for closing by the Base Realignment and Closure Commission and all of its activities were to be transferred to Marine Corps Air Station Miramar. The station officially closed on July 2, 1999. The closing of MCAS El Toro ignited a political firestorm over the eventual fate of the facility. With the existing infrastructure, some favored converting the base into an international airport. Those favoring the new airport tended to come from northern Orange County (desiring the convenience of a closer airport), and from areas in Newport Beach that are within the arrival and departure noise zones surrounding John Wayne Airport (hoping to close that airport in favor of the new one at El Toro). Those against the airport proposal were largely residents of the cities in the immediate vicinity of El Toro, such as Irvine, Lake Forest, Laguna Niguel, Laguna Woods, Dana Point, and Mission Viejo, where residents were alarmed at the idea of the aircraft noise. The cities opposed to the airport created a joint powers authority, the El Toro Reuse Planning Authority (ETRPA), to oppose the project. They were joined in the effort by grass-roots organizations that collected record numbers of signatures on petitions to place anti-airport initiatives on the ballot and raised funds for the election campaigns. The volunteer-run El Toro Info Site  was the Internet voice of the movement and one of the first political blogs. This faction lobbied strongly in favor of other uses for the property. The city of Irvine sought to annex the property for park and related uses. Air station insignia An earlier cartoon version was designed by Walt Disney Studios. The battle between pro-airport and anti-airport groups dominated Orange County politics for much of the late 1990s and early 2000s. Airport proposals were defeated in two hotly contested ballot initiatives, and further challenges took place in the courts. A series of demonstration commercial flights from the airport in June 1999 generated less noise than the former military flights, but resulted in much public outcry due to the use of different flight paths from the military, and incessant circling over nearby cities to line up for another approach. 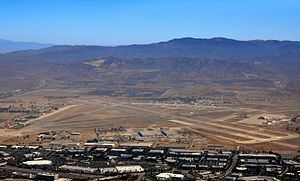 Eventually the airport opponents prevailed, and in March 2002, the Department of Defense announced that it would sell the land to private interests to be developed into Orange County Great Park. This decision came right after the military stated that it wanted to return to the base. Before the site could be developed for civilian use, the Department of the Navy (which oversees both the Navy and the Marine Corps) was required to perform environmental remediation to clean up contaminated soil on the site. The contamination was caused by volatile organic compounds (VOCs), primarily industrial solvents that had been used over the years for purposes such as degreasing, paint stripping, and the cleaning of aircraft. Over the years, the VOCs had seeped into the groundwater, resulting in a plume of contaminated groundwater extending for three miles (5 km) to the west of the station. In July 2005, the Department of the Navy's Base Realignment and Closure (BRAC) Program Management Office (PMO) issued a public notice stating that the cleanup of the contaminated soil was complete. The cleanup of the groundwater is being handled by the Irvine Desalter Project, a project of two local water authorities that has financial backing from the Navy and the State of California. The Department of the Navy hired the General Services Administration and Los Angeles-based Colliers International to assist in the sale of MCAS El Toro. Colliers branded the project as Heritage Fields combining the long-standing history of the base and what the future of the base will be to the community and the generations to come. An online auction was conducted and in February 2005, the final bid of $650 million was accepted for the four parcels of land comprising the former MCAS El Toro. The auction winner was Heritage Fields LLC, a joint venture between developer Lennar Corporation and several other firms. Development plans for the 3,724 acres (15 km2) site include residential, golf, commercial, R&D, and schools. 1,375 acres (5.6 km2) of the site will be dedicated to the Great Park. A ceremony to formally transfer ownership of the property to Heritage Fields LLC was held on August 29, 2005. On June 25, 1965, a U.S. Air Force Boeing C-135A bound for Okinawa crashed just after takeoff at MCAS El Toro, killing all eighty-four on board. On July 30, 1970, a KC-130F of VMGR-352 crashed and burned during a maximum effort landing, killing 4 of 5 crewmen on board. On July 4, 1986, 21-year-old Marine Lance Corporal, Howard Foote Jr., an aviation mechanic at El Toro, took an A-4 Skyhawk on an unauthorized 90 minute joyride over southern California. Foote, an accomplished glider pilot, was despondent after learning that due to a medical condition, he would never be able to fly in the Marines. He landed the aircraft safely and was subsequently discharged under less than honorable conditions after serving 4 1/2 months in confinement. On Feb 12, 1987, a CH-46E helicopter from HMM-764, MAG-46 crashed, shortly after takeoff, into a steep, brush-covered ridge between Bell and Trabuco canyons. All three crewmembers on board, Major Dudley Urban, Major William Anderson, and Staff Sergeant Bradley Baird, died in the crash. On April 24, 1988, Marine Corps Colonel Jerry Cadick, then commanding officer of MAG-11, was performing a tactical aerial demonstration at the MCAS El Toro Air Show before a crowd of 300,000 when he crashed his F/A-18 Hornet at the bottom of a loop that was too close to the ground. The aircraft was in a nose-high attitude, but still carrying too much energy toward the ground when it impacted at more than 300 mph (480 km/h). Col. Cadick was subjected to extremely high G forces that resulted in his face making contact with the control stick and sustaining serious injury. He broke his arm, elbow and ribs, exploded a vertebra and collapsed a lung. Col. Cadick survived and retired from the Marine Corps. The crashed F/A-18 remained largely intact but was beyond repair. On January 22, 1991, Marine Corps Colonel James Sabow apparently committed suicide amid allegations of base corruption, specifically using military aircraft for personal use. His family and friends denied he committed suicide and pointed out that Col. Sabow had pledged to fight the charges against him just minutes before his death in phone conversations with other officers. According to a 1996 lawsuit, Sabow was murdered because he threatened to expose an authorized covert operation at El Toro involving some of his fellow officers, CIA-sponsored airlifts to Central and South America, running arms and drugs. A forensic analysis conducted appeared to indicate the death was homicide and that evidence had been altered. On 2 May 1993, during the 1993 MCAS El Toro airshow, an F-86 Sabre crashed on the runway after failing to pull out of a vertical loop. The F-86 pilot, James A. Gregory, died on impact. No one was hurt on the ground. The airshow continued. Normally the F-86 performed with a MiG-15, but the pilot of the Mig-15 was ill that day and the F-86 was doing a solo run. The MCAS El Toro Air Show took place annually from the 1950s until 1997. It featured the U.S. Navy Blue Angels, as well as the USAF Thunderbirds. The Air Show also featured new aircraft that were coming into active service, such as the B-2 stealth bomber. Other displays featured military vehicles. The show also had a large gathering of vendors of military items and memorabilia. The final Air Show in 1997 drew an estimated two million visitors. MCAS El Toro was regularly used for flight operations by Special Air Missions during President Richard Nixon's term in office, in support of the "Western White House", Nixon's home at San Clemente. The final Nixon flights were, first, when he landed there upon resigning the White House in 1974, and again, after his death in 1994, when his body was flown to California for burial. He flew both times in his Air Force One, SAM 27000. In 2006, an abandoned F-18 hangar in Irvine California was sealed to create, in effect, a giant pinhole camera, and a panoramic print of the El Toro Air Station was formed on a light-sensitive muslin cloth measuring 111 feet wide, 32 feet high. Under the direction of Laguna Beach photographer Jacques Garnier, the image, known as “The Great Picture”, was originally produced as part of the Legacy Project - a photographic and historical record of the base before being transformed into what is now the Orange County Great Park. This is believed to be the largest photographic image ever taken by a camera. From 2005 to 2012, depending on the year, there were small air shows, fireworks, family New Year's Eve (the balloon dropped at 9 pm) and other events related to Growing the Park, at the Great Park, the new name for the site. El Toro was featured in the 1996 film Independence Day. It was the base where lead character Captain Steven Hiller (Will Smith) was stationed. The base was attacked and destroyed by the aliens. MCAS El Toro was featured in the 1986 Clint Eastwood film Heartbreak Ridge. The closing scene of the movie, when the characters return to the United States, was filmed at El Toro. Wikimedia Commons has media related to Marine Corps Air Station El Toro. ^ a b M.L. Shettle, Jr. "MCAS El Toro". Historic California Posts: Marine Corps Air Station, El Toro. The California State Military Museum. ^ Hardigree, Matt (October 24, 2010). "Top Gear USA: The Stig's New Track". Jalopnik. ^ O'Hara, MCAS El Toro, p.7. ^ Freeman, Paul. "Abandoned & Little-Known Airfields: California - Southeastern Orange County". El Toro MCAS (NZJ), El Toro, CA. ^ "July 2005, Public Notice - Cleanup of Contaminated Soil Successful at IRP Site 24 VOC Source Area, No Further Action Proposed". Department of Navy Base Realignment and Closure Program Management Office. Archived from the original on 2007-02-06. Retrieved 2006-07-13. ^ "Water Quality". Irvine Desalter Project. Archived from the original on 2006-06-26. Retrieved 2006-07-13. ^ "ASN Aircraft accident Boeing C-135A-BN Stratolifter 60-0373 Santa Ana-El Toro MCAS, CA (NZJ)". Aviation Safety Network. ^ Weikel, Dan (February 18, 1991). "Airing His Ideas : Howard Foote Once Took a Marine Jet for a Joy Ride, but What He's Attempting Now Is No Flight of Fancy". LA Times. Retrieved 17 March 2014. ^ Rogoway, Tyler (November 28, 2015). "The Tale Of When A Marine Mechanic Stole An A-4 Skyhawk For A Joyride Over California". Retrieved November 28, 2015. ^ Beene, Richard (April 25, 1988). "300,000 Watch in Horror as Fighter Crashes Spectators Say F/A-18 Jet Appeared to Stall as Pilot Was Making a Loop". L.A. Times. p. 1. ^ "Inquiry Into El Toro-Based Colonel's Shooting Death Reopened by Marines". Los Angeles Times. 14 December 1991. Retrieved 7 November 2015. ^ Schou, Nick (17 February 2000). "Who Killed Col. James Sabow? Was Marine Corps Col. James Sabow the victim of a military cover-up?". Orange County Weekly. Retrieved 7 November 2015. ^ Burnett, Bryan R (13 September 2014). "Defrauding of the US Congress by elements within the US Military: The Murder of Marine Col. James E. Sabow". San Diego Source. Retrieved 7 November 2015. ^ Burnett, Bryan R. "Investigation of the death of Colonel James Sabow, USMC". Meixa Tech. Retrieved 7 November 2015. ^ "The Good Life at San Clemente". Time Magazine. September 29, 1975. Retrieved 2007-11-19. ^ Jones, Charisse (April 25, 1994). "Songs and Salutes for Nixon's Final American Journey". New York Times. Retrieved 2007-11-19. De Chant, John A. (1947). Devilbirds: The Story of United States Marine Corps Aviation in World War II. Harper and Brothers Publishers. O'Hara, Thomas (1999). Images of America - Marine Corps Air Station El Toro. Charleston, South Carolina: Arcadia. ISBN 0-7385-0186-7. Rottman, Gordon L. (2002). U.S. Marine Corps World War II Order of Battle - Ground and Air Units in the Pacific War, 1939 - 1945. Westport, Conn: Greenwood Press. ISBN 0-313-31906-5. Sherrod, Robert (1952). History of Marine Corps Aviation in World War II. Washington, D.C.: Combat Forces Press. Shettle Jr., M. L. (2001). United States Marine Corps Air Stations of World War II. Bowersville, Georgia: Schaertel Publishing Co. ISBN 0-9643388-2-3. Kranser, Leonard (2002). Internet for Activists - A hands-on guide to Internet tactics field-tested in the fight against building El Toro Airport. Dana Point, CA: iUniverse. ISBN 0-595-23857-2. "El Toro Marine Corps Air Station". GlobalSecurity.org.